With this absurd, even selfish, thought, I sat down to watch Alistair McDowall’s Talk Show directed by Caroline Steineis. The story of three generations of men, all of them struggling to survive financially, emotionally, existentially. The more they need each other, the more they drift apart. Through pride and stubbornness, they barely keep their head above the water. Sam (Ryan Sampson) holds onto his talk show as if it is a lifeboat. Jonah (played with raw abandon by Jonjo O’Neill) has faced the worse anyone can face and struggles to connect. Bill (Ferdy Roberts), working class and out of work, refuses to acknowledge this brave new world might not have a place for him. Ron (Alan Williams), wearing a Ramones Forever t-shirt and old enough to know that hardly anything makes sense, calmly focuses everyone’s thoughts on what’s important and true. All actors are deeply affecting, with Jonjo O’Neill and Ryan Sampson having the richest opportunities, but also Ferdy Roberts and Alan Williams being beautifully understated. The play’s energy seems effortless, with subtext swimming in and out of view. The humour, often very funny, oozes desperation. (Arson is suggested as a bonding exercise – “We can do it together as a family”). 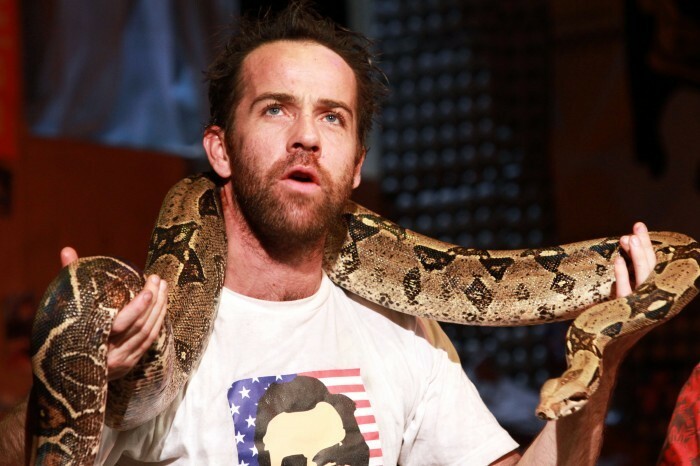 Interesting theatrical devices add to the tension (I loved the use of the baby monitor for overhearing and mishearing conversations) and playfulness comes in unexpected forms: it’s not often you see a six feet live snake draped across an actor’s shoulders (I kid you not). In the end, the play, one of the best offerings in the Royal Court Weekly Rep season, asks one simple question: why is it so difficult for people to draw strength from each other? By next morning, news confirmed that Paul Bhattacharjee was dead. Reading the obituaries, I realised I had seen him in more plays than I remembered: The Great Game, The Physicists, Odon von Horvath’s Faith, Hope and Charity. I am sad for someone I didn’t know and it still doesn’t make sense. It never does. RIP Paul Bhattacharjee. This entry was posted in Reviews and tagged Alistair McDowall, Jonjo O'Neill, Paul Bhattacharjee, Royal Court, Royal Court Weekly Rep, Ryan Sampson. Bookmark the permalink.